Michael Kors-branded Android Wear smartwatches are manufactured by Fossil, something that some buyers know and some buyers don't, but Michael Kors smartwatches are considered to be more of the luxury smartwatch that some crave. After all, if consumers are going to pay $300 for a smartwatch, why not get one with a luxury look and feel, right? Well, some would love to have a more luxury-looking smartwatch but don't see the point in shelving out so much money on a platform that isn't as popular as Samsung's Tizen, for instance. Fortunately, there are always discounts on tech items (including wearables). 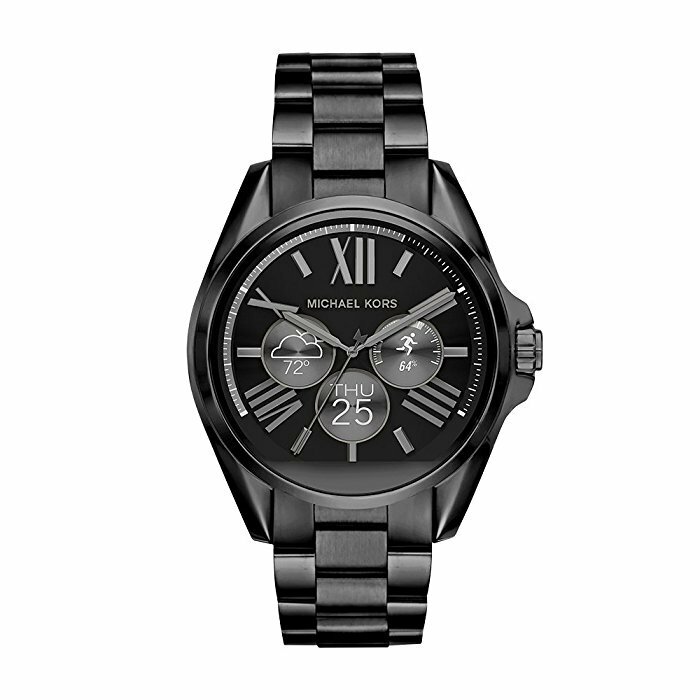 There's a new discount today on a Michael Kors smartwatch: the Michael Kors Access Bradshaw. This is the second Michael Kors-branded smartwatch to hit the Google Store for sale in December, only to see the Michael Kors Access Bradshaw removed from the Google Store in three months. It appears as though the device didn't sell that well at its price point of $350. In contrast, look at how quickly the Moto 360 sold out at the Google Store when it was discounted to $99.99. The Michael Kors Access Bradshaw, once priced at $350, has now been discounted 25% at Amazon down to $262.50. This means you're saving $87.50 off the original retail price, a nice savings for those who've been eyeing this model for some time. As a refresher, the Michael Kors Access Bradshaw features a 1.4-inch LCD display with a 290p screen resolution, Snapdragon 2100 Wear SoC, 512MB of RAM, 4GB of storage, and a 400mAh battery with 10-meter water resistance to brave the elements. While sales haven't been all that great for Fossil with this smartwatch, though, you do get to choose between either Black or Blue colors. Additionally, the Access Bradshaw did make Google's Android Wear 2.0 update eligibility list, so you don't need to worry about missing out on Google's latest (including the on-wrist Google Play Store for app downloads, virtual on-screen keyboard, customizable notifications, more standalone apps, and so on). We don't know how long this deal will last, so don't wait another minute. Head on over to Amazon here for Black and here for Blue to take advantage of a good thing. Let us know which color you bought and why you picked up the Access Bradshaw over all other Android Wear smartwatches.